36 Colors Marker Set for Manga Anime. Color scheme: V09 / RV11 / RV29 / R02 / R08 / YR04 / YR24 / Y11 / Y13 / Y15 / YG03 / G07 / G17 / G21 / G28 /. B05 / B06 / B14 / B29 / B32 / B39 / E09 / E29 / E33 / C-1 / C-3 / C-5 / C-7 / C-9 / W-1 / W-3 / W-5 / W-7 / W-9/100/110. Size: 326 (W) × 64 (L) × 155 (H) mm. Be sure to add me to your favorites list. 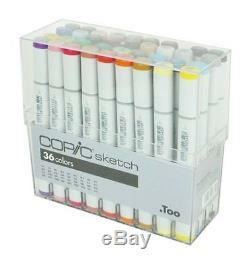 The item "NEW Offical Copic Sketch 36 Colors Marker Set for Manga Anime" is in sale since Friday, July 31, 2015. This item is in the category "Crafts\Art Supplies\Drawing\Pens & Markers". The seller is "yutyoshi" and is located in japan.